"Kelly E. Powers, Westbrook College, Class of 1978"
Westbrook College student Kelly E. Powers, Class of 1978, was a Nursing major and a Day Hop. For her senior class candid photo, which appeared in the 1978 Tower Yearbook, she wore a diagonally striped dress over dark tights and a turtle neck jersey. Her long, dark hair was parted in the middle and pulled back. 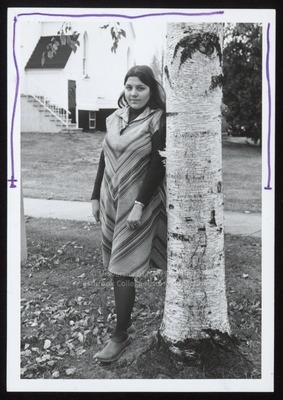 Kelly leans against a white birch tree trunk on the side of the Campus's Library-in-a-Church.